This morning I woke up and looked over at Rush’s crate to see him sitting up and staring at me. Not a sound, but he was ready to get up. Smart puppy! I took him and the girls out and he went right behind a bush to pee. Smart puppy! We came back in and I got out the kibble to feed everyone their morning snack–and he saw me put food in Elly’s bowl, and he saw me move toward Dancer’s bowl, and he ran into his ex-pen for his breakfast instead of trying to get a bite out of their bowls. Smart puppy! He is now ten weeks old and weighs just a hair more than 14 pounds. This entry was posted in life with poodles on July 20, 2011 by Diana. 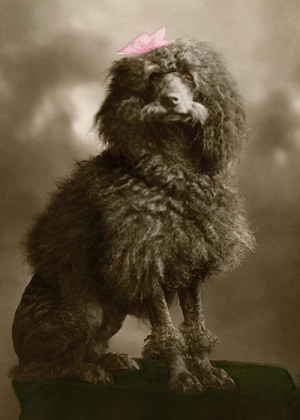 This photo from an exhibition of dog photography in London (17 photos are included in this article: Dog Photography) shows what poodles looked like in the days before electrical clippers, blow dryers, and hairspray.